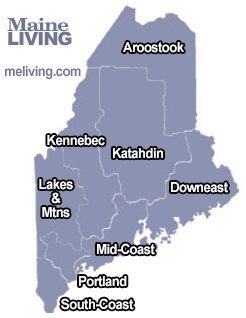 Aroostook County, Maine Vacation Rentals – Another great reason to visit Maine. Aroostook County, Maine has a fabulous selection of vacation rentals, lakeside cabins and mountain lodges to accommodate every budget and lifestyle. Let us introduce you to the finest rental lodging in northern Maine. Ask us about Maine hotels or share Maine hotel reviews. To feature your Maine Lodging, contact us. Great three bedroom home perfect for a getaway skiing at Sugarloaf Mtn., hunting/fishing in the northern Maine woods or snowmobile from the property to the vast trail systems leading all through out Maine and Canada. Two bedrooms and a large sleeping loft sleeps 8 comfortably. Additional Ammenities: Glass front woodstove, open kitchen with plenty of room to relax. Plan a relaxing seaside escape to this 3BR/2BA waterfront home in East Boothbay. With three comfortable bedrooms plus a futon, there?s room for six guests. Go swimming or kayaking right in your backyard, or launch a boat directly across the street at the Murray Hill boat ramp. Perched on a hilltop overlooking the Sheepscot River sits this 3BR Davis Island cottage. The two-story home features a gourmet kitchen, gas fireplace, radiant heat, as well as a balcony and large deck. Enjoy expansive bay views, beautiful walking trails, and a dock. Located at the Sheepscot Harbour Village Resort and just a short walk to Wiscasset. Originally built in 1920, this bright and airy two-level 2BR/1.5BA beachside property features upscale design elements including wood beam ceilings, a gourmet kitchen, and hardwood floors as well as a private fenced yard. Please note this dog-friendly duplex has an adjoining, yet separate, unit that may be occupied. Enjoy a unique getaway experience at this 2BR brewer?s cottage conveniently located on the same property as Boothbay Craft Brewery and Watershed Tavern. Your updated cottage features hardwood floors and a patio with a grill as well as a spacious shared outdoor area that?s perfect for yard games. Perched on the edge of the sea, a treasured family home is ready for you to settle in for a memorable Maine Vacation. This single-level two bedroom, two bath cottage is well equipped and comfortably furnished. Large windows throughout bring the beauty of nature inside with stunning views of the Atlantic Ocean.